It's An Exciting And Rewarding Profession! 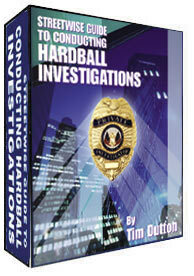 "Serving The Training Manual Needs Of Investigators for 25 Plus Years!" Every one hundred or so years, one of thousands of books come along that becomes the standard reference of a certain subject or profession. 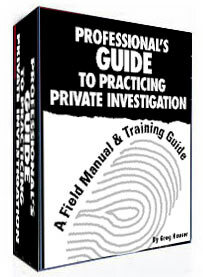 We feel Greg Hauser's new Professional's Guide To Practicing Private Investigation is that book for developing the skills and acquiring the knowledge base needed to practice private investigation today. 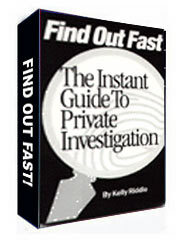 FIND OUT FAST-PRIVATE INVESTIGATION MADE EASY! 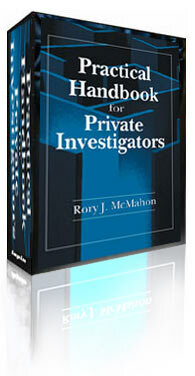 Written as an instant guide on conducting investigations, this new work shows you the techniques and sources used to quickly conduct inquiry to obtain information on the major types of checks needed today. 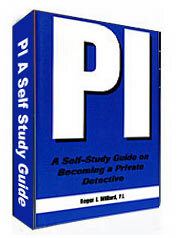 If your goal is to launch a career in private investigation, you've got to do your homework. This self-paced, hands-on workbook and guide will prep you on education and training, licensing, office equipment and supplies, marketing, field equipment, report writing, photography and videotaping, firearms and more. And What The Future Holds For You! A Master Thesis - By M. Ettisch-Enchelmaier, B.A. 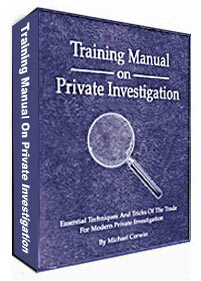 Develop powerful knowledge on what to specialize in, how to market those types of cases and how to successfully complete the assignments from one of the nation's most successful private investigators. 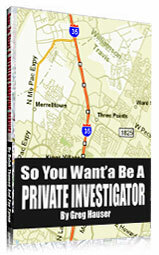 BECOMING A PRIVATE INVESTIGATOR SEARCH ENGINE! To Conduct A Search On Investigation.